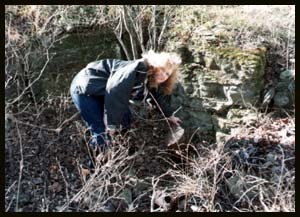 Me in great grandma Nancy Gafford Sanders Dunback Ziegler's cellar I found this old cellar remains on 12-18-1997. 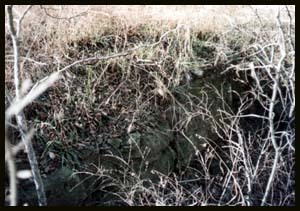 The house used to be just West of the cellar. 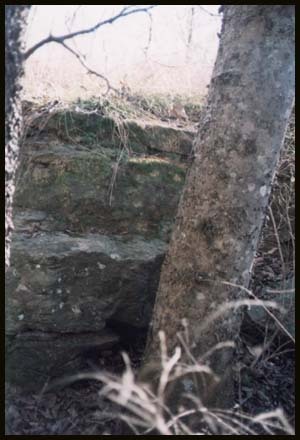 The house faced South and was just inside the Cherokee county line not far from the Pecan tree. I have heard daddy and other old people talk of the Pecan tree. It was a big Pecan tree that was right in the middle of the road on the county line of Muskogee and Cherokee counties. They had brush arbor meetings and picnic's and etc, at that old Pecan tree for many years. My daddy met my mama in 1936 when she and my aunt Aggie were walking to hear the preaching at the Pecan tree. Daddy and mama were married in Dec 36 just South of the Pecan tree about a mile in the middle of the county line road on the Muskogee side. I hope you saw the web page about it. The old steps of the cellar Lucille Conrad lived with her parents and the rest of the family across the road from Nancy's house. She said she has been to "aunt Nancy's" house many times and has walked down those cellar steps many times. She said there used to be a smoke house on top of the cellar where they smoked meat. 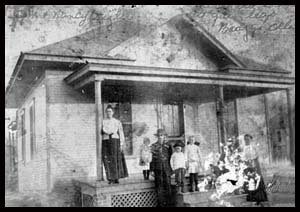 Lucille lived on the East side in the Muskogee side and the county road was between them. The pecan tree was just North of them. The old Nancy Gafford Sanders Dunback Ziegler house.